Delivery and pickup are not included in the rental rates. 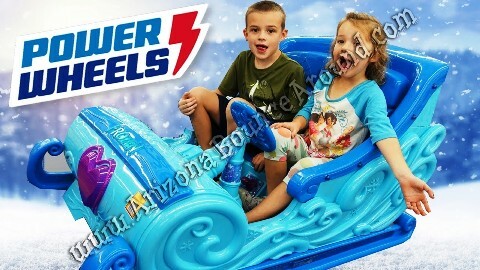 Our Electric Sleigh Rides can only be used on smooth flat, level surfaces. No grass, dirt, rocks or hills. Our Electric Sleigh rides are capable of going speeds of 2.5 mph in forward or reverse, with a maximum speed of 5 mph. Our battery powered Sleigh rides are made to carry one driver and one passenger. Our Sleigh Rides feature authentic Disney Frozen graphics, flashing lights and a magical tune that plays on command. All of these features will make this sleigh ride easily stand out and make your holiday party or event memorable. It's ideal for children from ages 3 to 7 or a total of 130 pounds. Sleigh Rides longer than 2 hours may require the renter to change the batteries during the event. We will supply a fully charged replacement battery for parties or events over 2 hours but this must be ordered in advance. Two Sleigh Rides will require about 20' x 30' feet of space so the more Sleighs you rent the more space you will need. 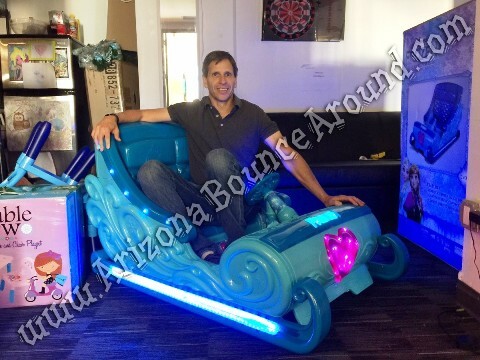 These are not bumper cars so the renter will be responsible for any and all damage to the sleigh rides.